Team Posco Chemtech — Kang Changbae 2P, Park Yeonghun 9P and Baek Hongsuk 7P — defeated Team Tbroad in KB League play on June 26. They won three out of their five games, putting them dead even with Team Marble in second place. 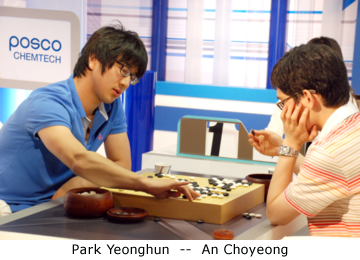 Kang Changbae’s win over veteran pro Mok Jinseok was somewhat of a surprise: Changbae was an amateur player from 2005 to 2008 and the South Korean representative in the 2007 Korea Prime Minister Cup World Baduk Championship, winning the tournament undefeated.